See how you can make your final arrangements. We plan for many things in life — retirement, vacations, our children's education. Doesn't it make sense to plan for your cremation too? And more! This guide will answer your questions about cremation, preplanning, providers, and urgent at-need situations. We plan for many things in life-retirement, vacations, our children's education. Doesn't it make sense to plan for your cremation too? 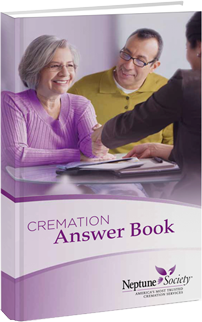 and more...this guide will answer you questions about cremation, preplanning, providers, and urgent at-need situations. Neptune Society is the largest provider of affordable cremation services in the nation. Thanks to the loyal support of generations of families, we’ve now grown to over 45 locations nationwide, with continued expansion ahead. Over the past 40 years, our experienced team has assisted families, their loved ones and caregivers carry out final wishes more affordably, with dignity and respect. Neptune Society offers exceptional value, quality and expert guidance during the cremation preplanning stages. We’re here for your family 24 hours a day, 7 days a week… whenever you need us. Just one call assures you compassionate, highly responsive service and professional management of cremation and cremation planning. Cremation is rapidly becoming the preferred choice over burial. If you think cremation is the right choice for you too, we look forward to serving your needs with all the professionalism and care you deserve.